Sighting In - HIND SIGHT INC.
Our eyes naturally gravitate towards the center of a circle, this is why rifle scopes, binoculars, and telescopes have round lenses. The sighting in process begins with proper arrow flight. If your arrows are not flying correctly, there is no sense in moving on to your sighting system. Most modern bows made today are designed for true center shots. What this means is that when the arrow is cradled in the arrow rest it is centered with the riser and limbs so that when taking aim, you are pointing the bow limbs, riser, arrow, and sights all in the same direction. A simple way to check this is to noc an arrow, stand over the riser, and see if the arrow is centered with the limbs. If the arrow is not centered, then you are pointing the riser in one direction and the arrow in another. However, you may get better arrow flight when set up this way. An arrow rest that is not set correctly can cause your arrows to fish tail right and left while in flight. The other thing to check is your noc point on the string. A noc point that is too high or too low can cause your arrows to porpoise up and down while in flight. A bow square can help you determine the best location on the string to position your noc. Once you have achieved proper arrow flight, you are ready to move on to your sights. If you think of a straight line from eye to impact, you are simply placing both of your sights on this line when taking aim. Start by securing your rear mounting bracket to the riser. 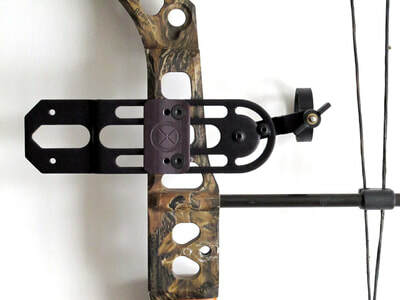 The model Hind Sight you purchase, your bow make and model, and the type of front sight you have will influence where you will position the rear aperture. The rear sight ring which holds the aperture must occupy its own space without any interference from the string or cables. Our mounting brackets are slotted so the rear sight can travel laterally towards the riser or towards the cable and string. 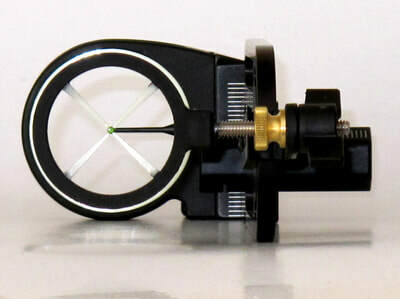 The farther the sights are mounted apart from one another, the more sensitive the system becomes to detecting bow torque. The image below on the left shows one of our basic add-on models mounted to a bow with a cable slide. A safe starting position for the rear sight ring is one inch forward of the cable slide when the bow is in a relaxed position. You want to ensure that the rear sight ring does not come into contact with the cable or string when the bow is fired. The image on the right has a cable slide bumper which can prohibit the cables from contacting the rear sight ring. Injury to the archer or damage to the rear sight may occur, if the string or cables come into contact with the rear sight. It is the archers responsibility to take necessary precautions to prevent the rear sight from coming into contact with the cables or string when the bow is fired. The basic add-on model shown above is mounted between the riser and a TruGlo front sight. Position the Hind Sight mounting bracket where the rear sight is in a safe location and then tighten the screws to the riser that holds the front sight in position. This will sandwich the basic Hind Sight mounting bracket between the riser and front sight locking it into position. Remove the rear sight ring at this time. The images below show our Xtreme Series mounting bracket on a LH and RH bow. Our mounting brackets are RH, LH reversible. The bow on the left has a cable rod and cable slide. The bow on the right has a cable roller capture system. This roller system of the cables allows you to position the rear sight ring very close to the cables. The Xtreme mounting bracket has an anchor block attachment that is drilled and tapped to accept your quiver. This attachment allows you to position the main frame and rear sight before you lock it down and secure it to the riser. 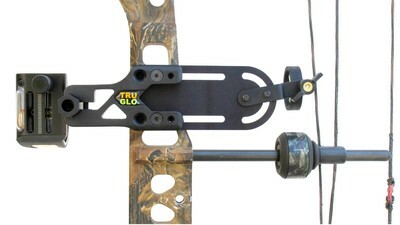 The image on the right shows the Xtreme mounting bracket with a TruGlo front sight attached to it. The best position to locate your sights is an equal distance or as close to equal from the center of the bow handle. This is the optimum location that allows you to detect bow torque. If you torque the bow in any direction, the sights will move an equal amount in opposite directions. Because you now have two sights that are fully adjustable, up and down, right and left, we recommend sighting in the front sight first. Position a single pin in the center of your pin housing. This pin can be any color and sighted in at whatever distance that you choose. This pin will become the pin that you anchor on inside the rear cross hairs each and every time you draw the bow string back. 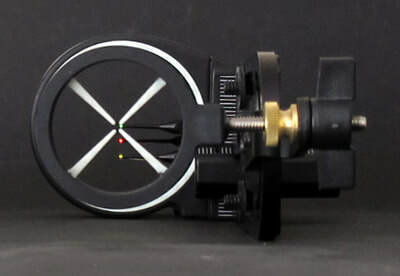 The cross hairs are centered inside of the rear sight ring, so it is very important that your centering pin is centered inside of the front pin housing. When set up and sighted in correctly, the rear sight ring and front pin housing will match in circumference perfectly like the images below. If you have a peep sight on your string, leave it in initially. This will help you with the sight in process. Sight in your centering pin with your peep sight like you normally would or by coming into a good solid anchor point. Shoot three arrows at close range. Move the pin housing containing the centering pin in the direction of the point of impact. 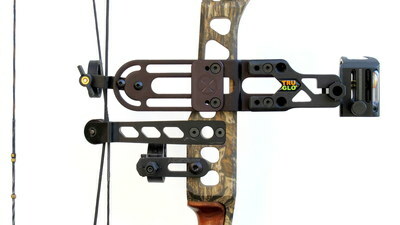 If the arrows impact right and low, you will adjust the front pin housing down and right. The centering pin will always remain in the center of the pin housing. Once sighted in at close range, step back and increase the distance to your target and repeat this procedure. Once you have sighted in your centering pin to the distance of your choosing you are ready to add pins and also sight them in. Once all your pins are sighted in, you are ready to reinstall the rear sight ring and position it in alignment with your front sight and comfortable anchor point. To achieve this, draw the bow back, get into your comfortable anchor position, and see how the rear sight ring lines up with the front pin housing. It is very important that the bow seeks its own position in your hand without any torque applied to the handle. Most likely the rings will be misaligned. Let down, make an adjustment of the rear sight in the direction that it needs to go to align with the front pin housing. Draw the bow back again and see how the sights line up. This may take a few tries before you get it right. If you are using your top pin as your centering pin when anchored, then the pin housing and rear sight ring will appear as the image does to the far right below. Once you get to this point, you are ready to shoot more arrows. Looking through your sights is a lot like looking through a rifle scope at this point. If your eye is not centered with both rings, you see it, and realize you are misaligned. Just like a scope cannot be tipped to see through it, Hind Sight works the exact same way. Once you draw back and anchor on your centering pin, the pin housing and rear sight ring will line up perfectly when taking aim and your centering pin will never leave the cross hairs. You will hold your bow the exact same way no matter what direction you point it in. Your other pins will be visible inside the rings. If you want to target another pin, place that pin on target, keeping your centering pin in the cross hairs and the rings in perfect alignment. 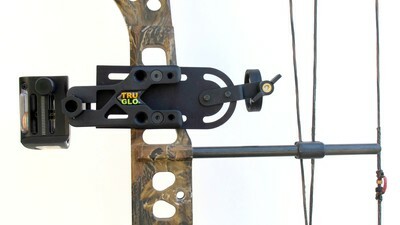 This ensures that you hold the bow the exact same way no matter what distance you are targeting. When sighting in, it is best to shoot a group of at least three arrows before making an adjustment of your sights. You will want to fine tune your sights at this point. If your arrows impact to the right, these are the adjustments that could be made. Move both front and rear sights to the right towards point of impact. Because your front sight is farther from your eye than your rear sight, the amount of travel towards point of impact will be slightly greater. Your eye should remain in same location. Move only the front sight right towards point of impact. This adjustment will also move your eye to the left in order to align with both sights. This could be a desirable adjustment if it feels more comfortable or takes your eye closer or father from the string. Move only the rear sight to the left. This will also move your eye towards the left, but position it in alignment with both sights and point of impact. Again, this could be a desirable adjustment. If your arrows impact low. Move both sights down towards point of impact with the adjustment of the front sight slightly greater than the rear sight. Your eye remains in same location. Move only the front sight down towards point of impact. This will cause your eye to teeter tooter up in the opposite direction. Move rear sight up. This will also force your eye up to look through your sights towards point of impact. Based on a straight line from eye to impact, you want to be in a comfortable anchor position, and set your sights accordingly. Do not torque the bow to line up your sights. Do not chase your sights by leaving your comfortable anchor position to line them up. When fine tuning, you should be making small adjustments towards point of impact. At this point, you may decide that it is time to remove the peep sight from your bow string. To accomplish this you must relax the tension on the bow string and limbs. Refer to your bow manufacturers owners manual to determine how to achieve this. If you do not feel confident that you can remove the string peep yourself, it is recommended that you take your bow to an archery shop and have it done for you. Once enough tension is removed from the the bow limbs and string, the string will become limp. The string peep can be removed at this point. Once the string peep is removed you can increase the tension to the limbs and string back to where they were, you are now ready to make your final adjustment of your sights. Now that the peep is out of the string you will no longer be able to position your eye directly behind the string. You must adjust your sights just off to one side of the string either to the right or to the left of it. Now that you have completed the sight in process, you should be able to draw your bow back with your eyes closed, get comfortable in your anchor position, open your eyes, and be lined up with your sights. If this is not the case, then you may want to continue fine tuning your sights. Remember this: Your sights will force you into the same hold each and every time you draw the bow string back. It is of the utmost importance that you seek your own comfort zone and set your sights accordingly. You will find that the Hind Sight sighting system leaves very little room for error so take your time, be patient, and watch it happen. One of the unique features that Hind Sight employs into it's complete sighting systems is patented circle on circle technology. 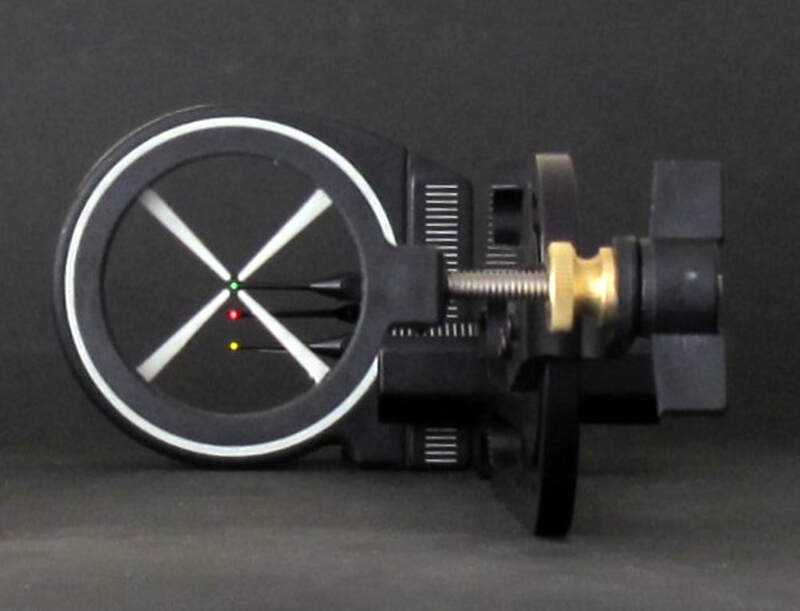 This allows the archer to distinguish the difference between the front pin housing and rear sight ring. If the rings are misaligned, it is visually verified because it is so easily recognized. 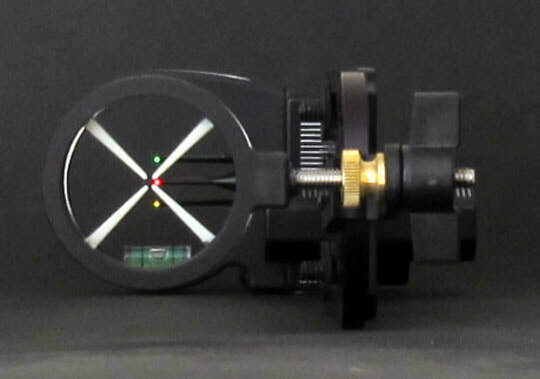 The pin housing and rear sight ring are of two different colors for this reason. The images above show the Eclipse model in perfect alignment and also with a slight bit of bow torque. The circles will instantly become misaligned when bow torque is present. 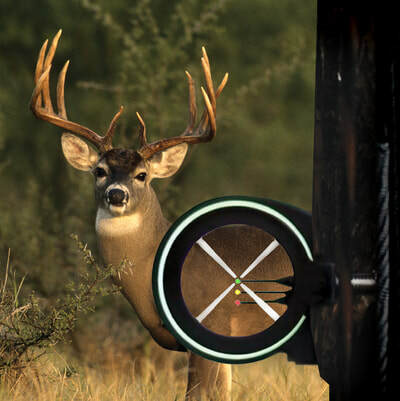 Hind Sight is one of the few sighting systems available that actually gauges bow torque. Torque the bow and you torque the sights. Instant feed back. The white ring attached to the pin housing will glow in the dark and is very easily seen under low light hunting conditions. This ring will frame your target and give you a secondary point of alignment. 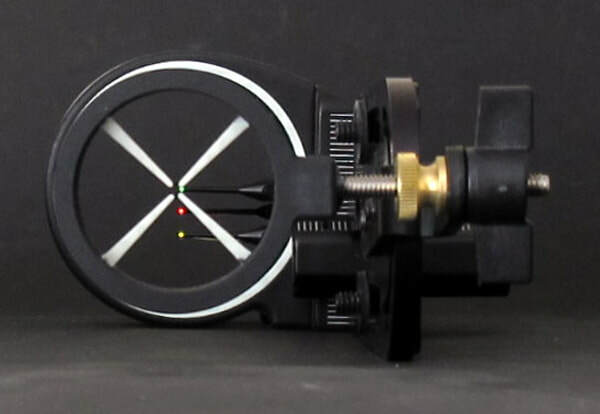 We have designed our dual sights specifically so that these rings interact with one another. Our add-on models can do the same thing, however we have no control over this aspect. Size and shape of the front sight and how far apart the front sight and rear sight are positioned will influence how they appear. Our rear sights are best suited with front sights that have round pin housings. The images above show the Ghost Rider using the red middle pin as the centering pin. 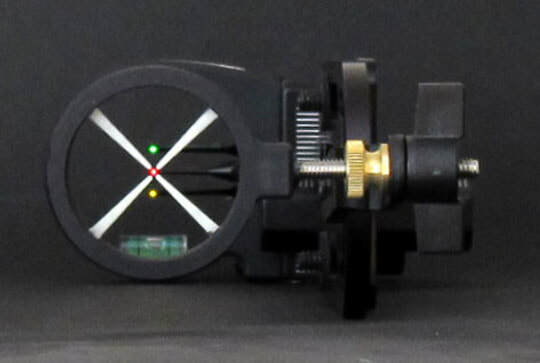 When this pin is centered inside the rear cross hairs, the glow in the dark ring attached to the front pin housing will disappear behind the rear sight ring. 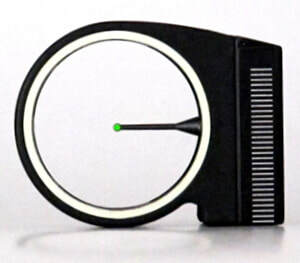 If torque is applied to the bow, the centering pin will float out of the rear cross hairs and the glow in the dark ring becomes visible. 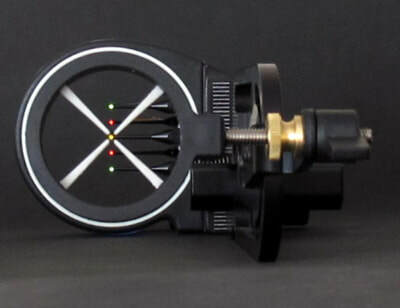 When using a five pin front sight, it is recommended that the middle pin be chosen as your centering pin. This places two pins above center and two pins below center. See image above left. The image on the right shows the top green pin on target at 20 yards. The yellow pin is sighted in at 30 yards and the bottom red pin is sighted in at 40 yards. When the circles are placed on target at this distance, they will narrow your attention down to the kill zone. The animal can still be viewed outside the rings, but you are focused on what's inside the rings and disregarding what is not. Rapid target acquisition happens naturally. With your eye gravitating to the center of the rings, it becomes very easy to take aim confidently, even on moving targets. "Hind Sight, Always 20 20"